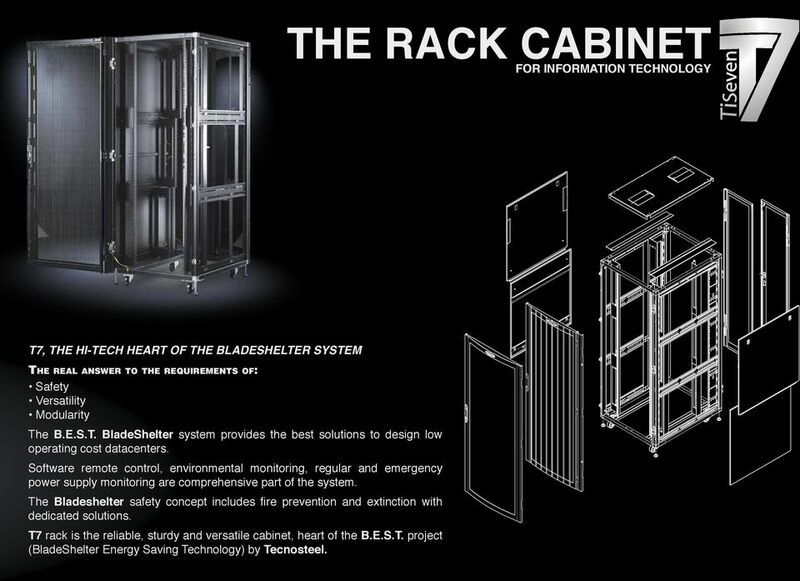 Download "THE NEXT GENERATION RACK FOR INFORMATION TECHNOLOGY"
3 THE RACK CABINET FOR INFORMATION TECHNOLOGY T7, THE HI-TECH HEART OF THE BLADESHELTER SYSTEM The real answer to the requirements of: Safety Versatility Modularity The B.E.S.T. 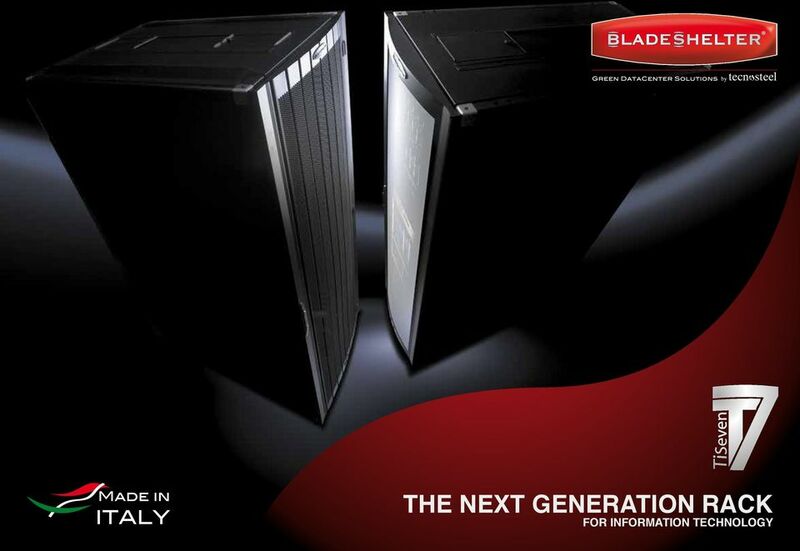 BladeShelter system provides the best solutions to design low operating cost datacenters. Software remote control, environmental monitoring, regular and emergency power supply monitoring are comprehensive part of the system. 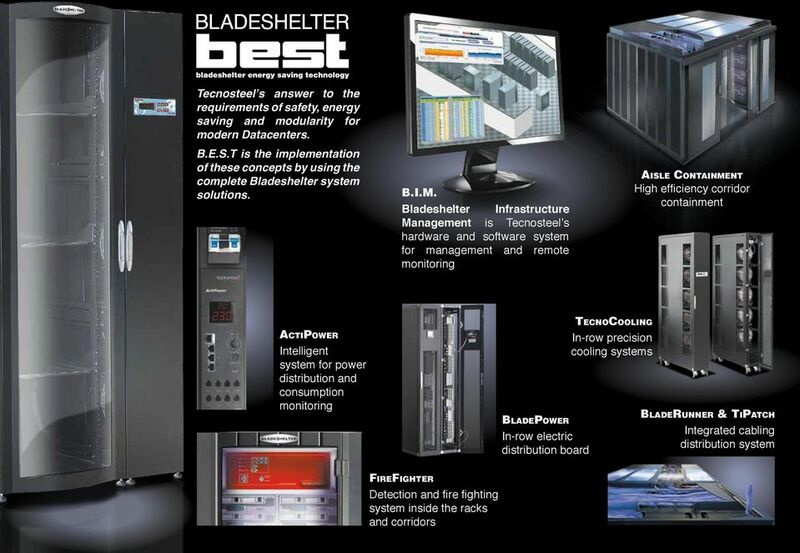 The Bladeshelter safety concept includes fire prevention and extinction with dedicated solutions. 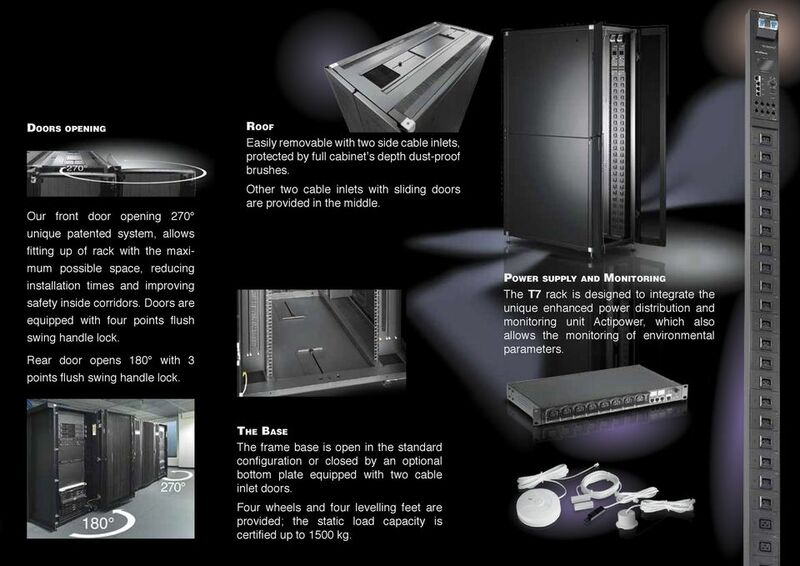 T7 rack is the reliable, sturdy and versatile cabinet, heart of the B.E.S.T. project (BladeShelter Energy Saving Technology) by Tecnosteel. 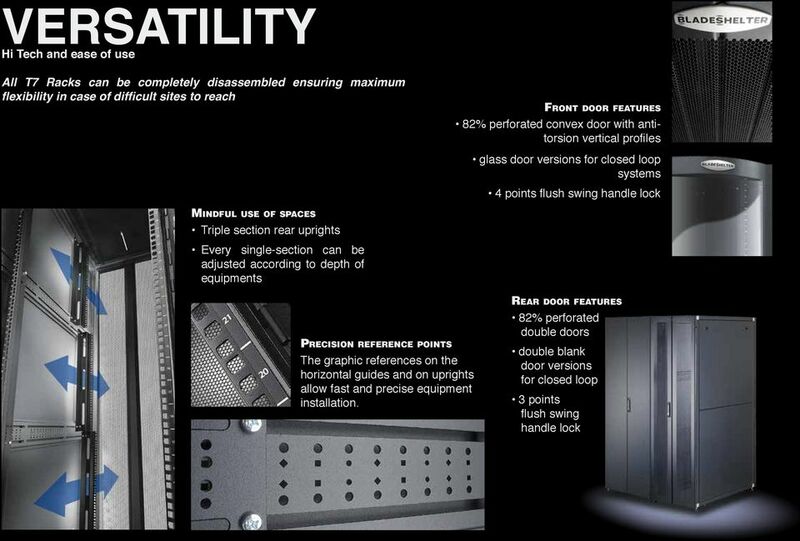 4 SAFETY Patented and Certified Information Technology Cabinets Safety and modularity are essential elements of the BladeShelter project which answers to every design requirement of new Data Centers bringing state of the art technology for the expansion of the existing ones. 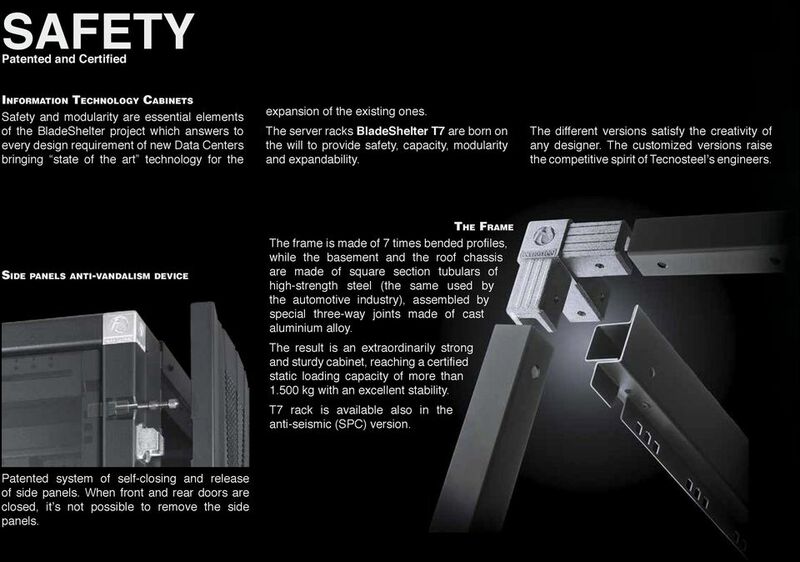 The server racks BladeShelter T7 are born on the will to provide safety, capacity, modularity and expandability. The different versions satisfy the creativity of any designer. The customized versions raise the competitive spirit of Tecnosteel s engineers. Side panels anti-vandalism device The Frame The frame is made of 7 times bended profiles, while the basement and the roof chassis are made of square section tubulars of high strength steel (the same used by the automotive industry), assembled by special three way joints made of cast aluminium alloy. The result is an extraordinarily strong and sturdy cabinet, reaching a certified static loading capacity of more than kg with an excellent stability. 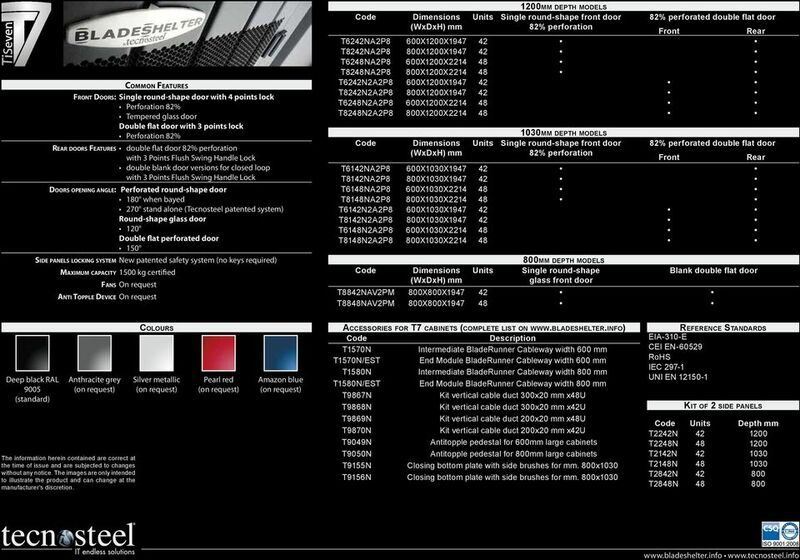 T7 rack is available also in the anti seismic (SPC) version. Patented system of self-closing and release of side panels. When front and rear doors are closed, it s not possible to remove the side panels. 5 Modular and scalable 100% compatible with all servers (the brands belong to their respective owners) Static load 1500 kg certified Seismic-proof resistance certified (SPC versions) Safety and modularity are the primary features of a T7 rack, born from an unique technology covered by patents and certifications. Seismic-proof NEBS zone4 certified Thanks to its structural features the T7 rack guarantees the protection of the installed equipments in the worst critical conditions. The frame enables the rack to absorb earthquake shakes even in most violent cases. Minimum vibration level protects servers thanks to the swaying of the whole structure. 7 Doors opening Our front door opening 270 unique patented system, allows fitting up of rack with the maximum possible space, reducing installation times and improving safety inside corridors. Doors are equipped with four points flush swing handle lock. Rear door opens 180 with 3 points flush swing handle lock. Roof Easily removable with two side cable inlets, protected by full cabinet s depth dust-proof brushes. Other two cable inlets with sliding doors are provided in the middle. Power supply and Monitoring The T7 rack is designed to integrate the unique enhanced power distribution and monitoring unit Actipower, which also allows the monitoring of environmental parameters. The Base The frame base is open in the standard configuration or closed by an optional bottom plate equipped with two cable inlet doors. Four wheels and four levelling feet are provided; the static load capacity is certified up to 1500 kg. 8 Cabling Management T7 racks are designed to accommodate different types of cables and allow their installation and positioning both inside and outside the rack. BladeRunner integrated solutions for T7 rack allow proper cable bend radius control and manage separately copper, fiber optic and power supply cables. 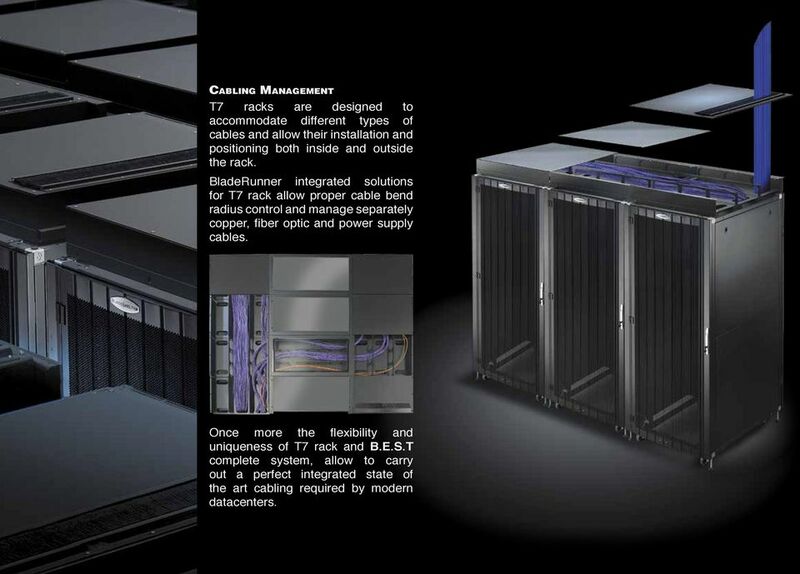 Once more the flexibility and uniqueness of T7 rack and B.E.S.T complete system, allow to carry out a perfect integrated state of the art cabling required by modern datacenters. 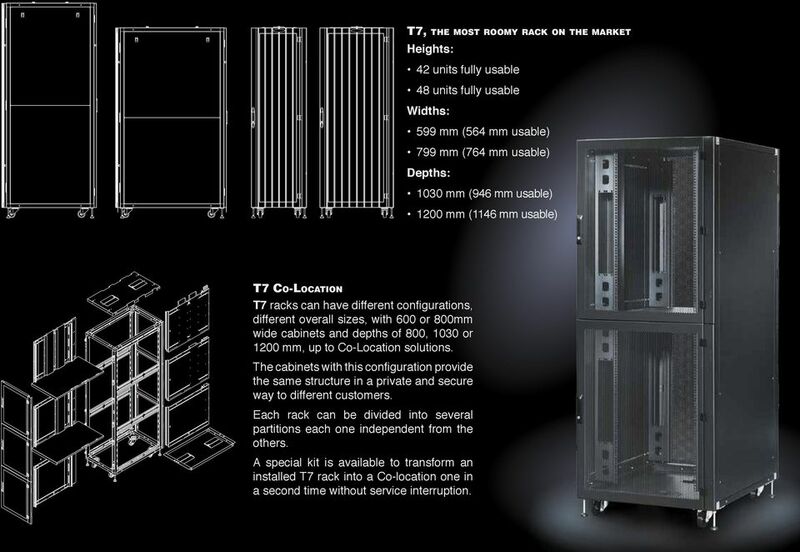 9 T7, the most roomy rack on the market Heights: 42 units fully usable 48 units fully usable Widths: 599 mm (564 mm usable) 799 mm (764 mm usable) Depths: 1030 mm (946 mm usable) 1200 mm (1146 mm usable) T7 Co-Location T7 racks can have different configurations, different overall sizes, with 600 or 800mm wide cabinets and depths of 800, 1030 or 1200 mm, up to Co-Location solutions. The cabinets with this configuration provide the same structure in a private and secure way to different customers. Each rack can be divided into several partitions each one independent from the others. A special kit is available to transform an installed T7 rack into a Co-location one in a second time without service interruption. 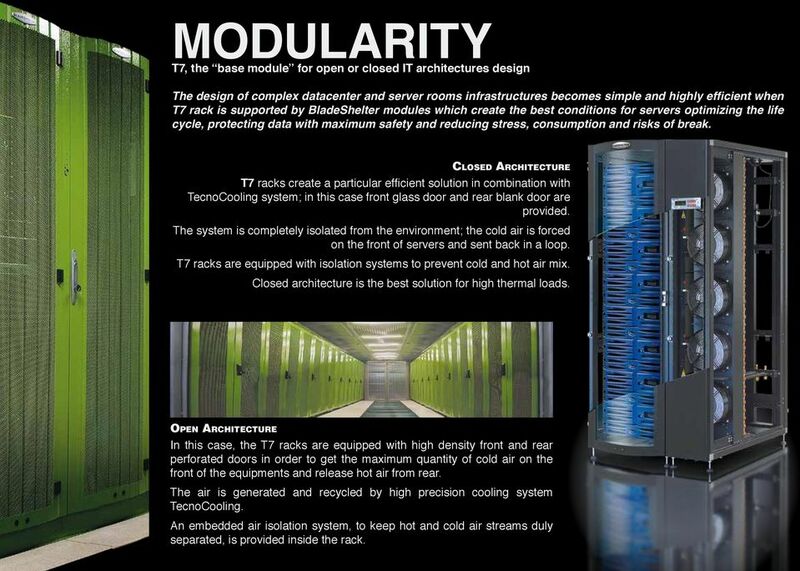 10 MODULARITY T7, the base module for open or closed IT architectures design The design of complex datacenter and server rooms infrastructures becomes simple and highly efficient when T7 rack is supported by BladeShelter modules which create the best conditions for servers optimizing the life cycle, protecting data with maximum safety and reducing stress, consumption and risks of break. Closed Architecture T7 racks create a particular efficient solution in combination with TecnoCooling system; in this case front glass door and rear blank door are provided. The system is completely isolated from the environment; the cold air is forced on the front of servers and sent back in a loop. T7 racks are equipped with isolation systems to prevent cold and hot air mix. Closed architecture is the best solution for high thermal loads. Open Architecture In this case, the T7 racks are equipped with high density front and rear perforated doors in order to get the maximum quantity of cold air on the front of the equipments and release hot air from rear. The air is generated and recycled by high precision cooling system TecnoCooling. An embedded air isolation system, to keep hot and cold air streams duly separated, is provided inside the rack. 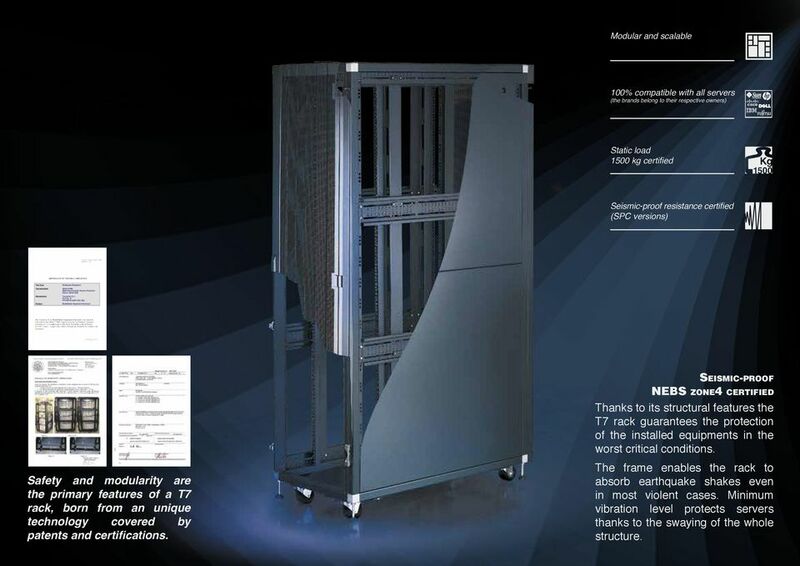 DATA CENTER RACK SYSTEMS: KEY CONSIDERATIONS IN TODAY S HIGH-DENSITY ENVIRONMENTS WHITEPAPER EXECUTIVE SUMMARY Data center racks were once viewed as simple platforms in which to neatly stack equipment. IT RACKS WHAT PART DO THEY REALLY PLAY IN YOUR DATA CENTER? INTELLIGENT WORKSPACE & STORAGE SOLUTIONS MEDIA STORAGE MEDIA STORAGE Overview Engineered Data Products (EDP) has enjoyed over 30 years of success by providing intelligent workspace and storage solutions. 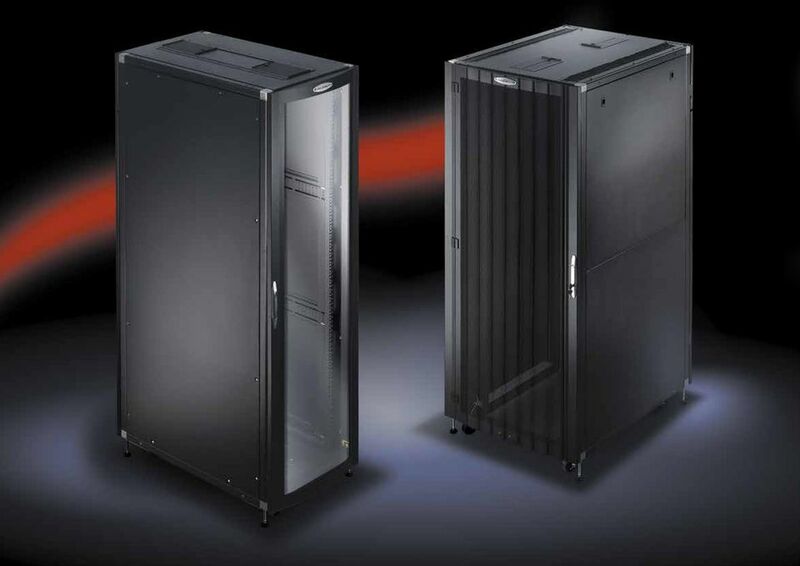 Racks & Enclosures. Deliver. Design. Define. Three simple words that clearly describe how we approach a Data Center project.